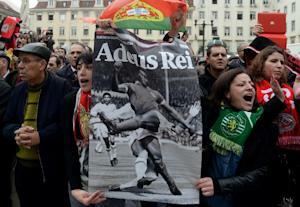 Lisbon (AFP) – Tens of thousands of people turned out in the rain on Monday to say a final farewell to Portuguese football legend Eusebio, who grew up in grinding African poverty to become one of the world’s greatest players. Mourners lined the streets of Lisbon and applauded as the black hearse carrying Eusebio’s coffin, draped in the red and white colours of his club side Benfica, passed by in a funeral cortege broadcast live on TV. 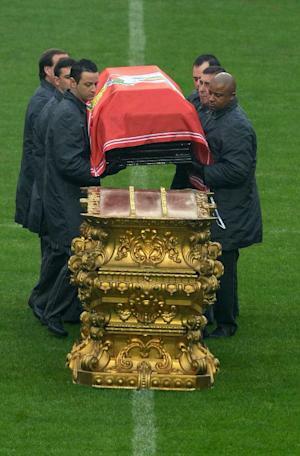 Earlier, about 10,000 mourners applauded and cheered as six pall-bearers carried the coffin and placed it on a golden plinth in the centre of the pitch at Benfica’s “Stadium of Light”. Flags flew at half mast across Lisbon, with the Portuguese government decreeing three days of mourning for Eusebio da Silva Ferreira, who died of a heart attack early Sunday aged 71. “Portugal has today lost one of its most beloved sons, Eusebio da Silva Ferreira. The country mourns his death,” President Anibal Cavaco Silva had said. Eusebio was buried at the nearby Lumiar cemetery after the mass. Portugal’s current football star Ronaldo dedicated his two goals in Real Madrid’s 3-0 win over Celta Vigo on Monday to Eusebio. “I want to thank everyone, especially to all the people in Spain for the homage they have paid to Eusebio. For the Portuguese it is very important to feel the warmth shown by the Spanish people,” said Ronaldo. Born into poverty in Africa, Eusebio scored 733 goals in 745 matches and rivalled all-time greats including Pele, Alfredo Di Stefano and Bobby Charlton. “I was the best player in the world, top scorer in the world and Europe. I did everything, except win a World Cup,” Eusebio said in a interview in 2011, recalling his tears after Portugal’s loss in the 1966 World Cup semi-final to England. From humble origins in the former Portuguese colony of Mozambique, Eusebio was to emerge as one of the world’s most feared strikers, combining panther-like pace with a ferocious shooting ability. With his exceptional technique, strength and goal-scoring record, it was not long before word of Eusebio’s prowess soon filtered back to Portugal and he joined Benfica. In an early game for Benfica he outshone Pele in a friendly against Santos and in 1962 he scored the crucial goals in a 5-3 victory over Real Madrid in the European Cup final. When Madrid’s legendary Hungarian Ferenc Puskas symbolically handed his jersey to Eusebio after the match, the message was clear — the torch had passed, and in 1965 Eusebio was awarded the Ballon d’Or. 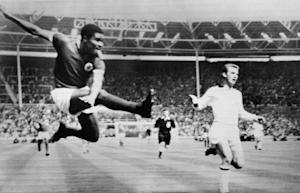 While Eusebio excelled with Benfica in Europe, it was his exploits at the 1966 World Cup for which he will be best remembered. Eusebio’s nine goals in England propelled Portugal to a third-place finish, and a succession of opposing teams simply had no answer to the power and pace of his play. He also earned European football’s Golden Boot award twice and was Portugal’s top scorer every season between 1964 and 1973. He helped Benfica to 11 league championships and five domestic cups. Married with two daughters, in retirement he became an ambassador for Benfica and the Portuguese football federation.